Acclaimed SF writer Pamela Sargent's book, Earthseed, told the story of Ship, a sentient starship that settled humans on the planet Home before leaving to colonize other worlds, promising to return one day. This classic YA science fiction adventure, optioned by Paramount Pictures, will be produced by the adaptor of the Twilight series. The adventure continues in Earthseed's stand-alone sequel, Seed Seeker. Over time, the colony of Home divided into those who live in the original domed buildings of the colony, who maintain the library and technology of Ship, and those who live by the river, farming and hunting to survive. The Dome Dwellers consider themselves the protectors of "true humanity" and the River People as "contaminated." For many years, the two populations interact solely through ritualized trade. Then a new light appears in the night sky. The River People believe it might be Ship, keeping its promise to return, but the Dome Dwellers, who have a radio to communicate with Ship, are silent, so Bian, a seventeen year old girl from a small village, travels upriver to learn what they know. As she travels, Bian ponders why the Dome Dwellers have said nothing. Has Ship commanded them to be silent, in preparation of some judgment on the River People? Or are the Dome Dwellers lying to Ship and turning Ship against their rivals? 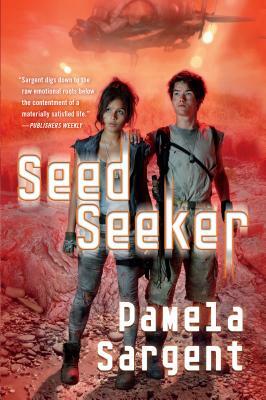 Seed Seeker is an adventure in colonization and conflict from a master of the SF field. Pamela Sargent is the author of many highly praised novels for young adults and adults, among them the historical novel Ruler of the Sky, the alternative history Climb the Wind, and the science fiction novels Venus of Dreams, Venus of Shadows, Child of Venus, The Shore of Women, Alien Child, and Earthseed, which was recently optioned by Paramount Pictures. She has won the Nebula Award and the Locus Award, and has been a finalist for the Hugo Award and the Theodore Sturgeon Memorial Award. She lives with writer George Zebrowski in upstate New York.